American Kurt Casseli showed his huge potential in the world of Rally after taking his second stage win on the stage 11 from La Rioja to Fiambala. The factory KTM man is competing in his first Dakar and up until eleven days ago had never ridden a Rally bike or competed in a navigational event. Casseli won the stage by a convincing 4m 45s from Speedbrain Husqvarna rider Paulo Goncalves. Third place went to Cyril Despres who was happy to race with the American before reigning himself in to focus on his overall rally lead. In this respect it was an excellent day for Despres who moved 13m 16s clear of second place man and team-mate Ruben Faria but even more significantly 18m08s ahead of his first genuine challenger Francisco Lopez. Lopez finished fifth on the stage and is now running out of time to mount a meaningful attack on Despres. 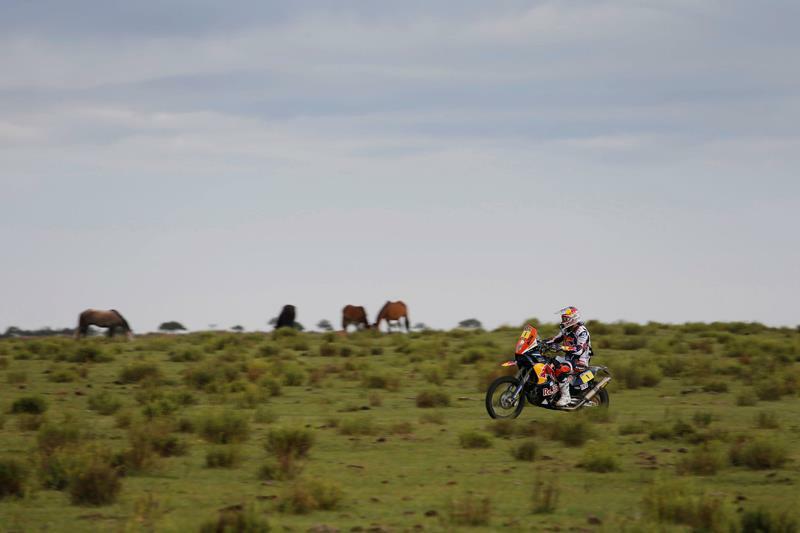 However, the Chilean rider will be buoyed by the fact that the race now returns to Chill, where he will receive unprecedented support from the thousands of fans that are expected to line the route.